Copyright Tony Mooney and others. Group-Captain D. N. K. Blair-Oliphant, O.B.E. 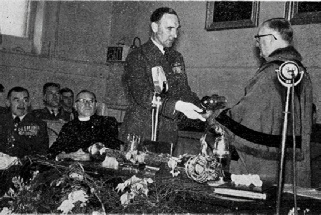 receiving the Scroll from Mr, H. J. Holcombe, Mayor the occasion of RAF Locking receiving the freedom of Weston-super-Mare in 1956.